Wolf Echo Valleys A Wolf Adventure, a Wild Encounter is a licensed educational outreach facility, and eco conservation center. Located within a beautiful pristine Provincial forest system in Saskatchewan, AWA-AWE is home not only to an amazing diverse eco system, but some bottle raised permanent captive wolf ambassadors. AWA-AWE is committed to offering visitors a unique experience with wildlife and the natural environment. 1) Commitment: AWA fosters, nurtures, inspires, and promotes a healthy respect of wildlife and surrounding habitat. We believe the only true way to attain an understanding of the importance of conservation, is through education. 2) Youth/Community: AWA-AWE targets the youth, as we have found that children learn to understand themselves more, and gain important tools in life dealings when they learn about their natural environment and residents in a close and personal manner. Animals and nature truly are healing agents all on their own. We honestly believe that when we focus on fostering healthy youth, we in essence also help create and foster healthy environments. 3) Protection: Wolves remain one of the most highly misunderstood creatures, and the myths abound of just what this feared predator is truly all about. Ask two different people and you usually get two different answers. Through interaction with our captive wild yet socialized ambassadors, they give the public an opportunity to see up close and in person what a wolf is, and what they are not. It is our hopes here at WolfEcho Valley that what people understand, they help to protect. AWA-AWE keeps up to date on the worldly protection of wolves, and supports programs that help to protect the wild lands in which such animals reside. 4) Education: Though it is A Wolf Adventure's firm belief and stance that wild should remain as such, we have also come to recognize the dire need for education, thus through our captive wolves we not only can help to foster and secure future wild wolf populations, but their natural habitat. Without an appreciation and abundance of natural habitat there will be no wild animals left to educate about. BUT it is more than just being able to see a wolf in captivity, that helps people to get involved with saving them. I don't think people connect with any wild animal, and wish to help protect them in the their natural habitat, unless they also make an emotional connection to the natural wild lands, in which those wild animals reside. This is where truly WolfEcho Valley is unique as they help visitors to also *make that connection* and walk away with more than simply seeing a wolf in a cage, which does nothing ultimately to foster a true wild wisdom. 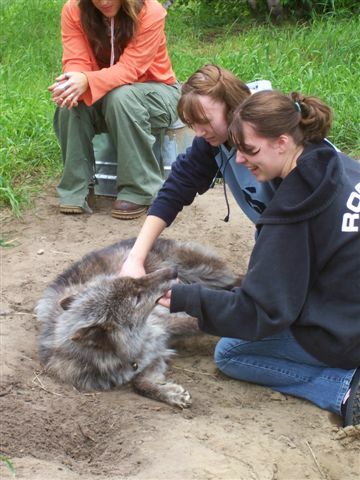 Visitors are able to interact on a more intimate level with AWA's ambassador wolves in their natural habitat, through personal observation and educational programs. 5) Conservation: Promoting an appreciation of everything wild. AWA's pristine lands are kept in their natural wild state. This helps foster an appreciation of everything wild, not just wolves. You will not find manipulated nor artificial environments for our captive wild residents. 6) Ecological Footprint: A Wolf Adventure, is also a TRUE Conservation minded facility as our own lifestyles reflect truly caring for the natural environment. Our sponsorship certificates are printed up on recycled paper, the cabin is heated using a grain stove, and vehicles run on bio-diesel, we use our own shopping bags (no plastic bags used here) These are but a few examples, (and we are consistently evolving ecologically at the Ranch, in an environmentally friendly manner.) We simply don't just talk about conservation, we put into practice our own advice, and leading through example. 7) Wild life rehabilitation: AWA-AWE supports, and implements wildlife rehabilitation practices at it's facility, as well as getting entire communities involved in playing their own part. Community involvement is acomplished via educational programs on how to become involved in keeping wild...wild! Act as responsible stewards for all wildlife, and of the natural environment. This is accomplished through exceptional care of the wild residents (releasable and non releasable), preservation and attainment of wildlands, and implementing wildlife rehabilitation at the facility. Continual development and implementation of leading edge educational programs, designed to inspire, motivate, and promote ecological principles in every day living. Programs designed in such a way as to encourage exploration, and understanding, of the natural environment and all it's wild inhabitants. Develop a state of the art facility which includes an outdoor/indoor eco classroom/gift shop. Improve facilities via expansion and restructuring to provide the wolves with the largest and most innovative of habitats. Enrichment ideas continue to be developed, and implemented, to provide necessary stimulation for the over all well being (emotional, physical, and nutritional) of the captive wild residents. Continue to develop and improve infrastructure of public facilities at AWA. To provide hands on learning through stimulating interactive displays. Very Special thanks to Louis Breton of LB consulting, and Tristin Miles for the brainstorming to help me put together AWE's complete Mission & Visionary Goals. AWE Maintains high standards of professional, personal and buisness conduct. Disseminates information and advice to the public in a professional manner . Displays the highest level of ethics, and integrity in all dealings. Stays in good legal and ethical standing as a member of other such organizations. Strives at all times to ensure the facilities are continuously improved, for the welfare and betterment of the animals in our care.